For certain kinds of humans who just don’t tolerate employment very well, the Very Small Business is often the only realistic choice for satisfying work and a satisfying life. But what drives you from a supposedly desirable spot amongst the busy worker bees will depend upon your particular eccentricities and social mores. Pointless paperwork and tiresome bureaucracy might be the trigger. Then there’s all the talking and fragrances and text tones and sports scores and click-clacking of dress shoes and keyboards. The absurdity and indignity of an “annual review” often illuminates the big “EXIT” sign that was there along. And how many mandatory meetings can you endure before the sorrowful mantra JESUS CHRIST WHAT HAVE I DONE WITH MY LIFE? becomes a tersely written resignation letter dropped off at “H.R.” on the way out the door for the very last time. I have a distant memory from the offices of a small newspaper where I worked, many decades ago: A co-worker put fish leftovers in the coffee room’s microwave, and as the vile rubbery odor moved through the whole place like the Angel of Death, something snapped in my brain. For a while I made do with one-man bureau assignments and working “remotely” once the technology caught up. Eventually, I became a “sole proprietor” myself. The sole proprietorship is cherished in American history, from Ben Franklin’s printing shop to … Well, that’s the main one, although Walt Whitman became a publisher himself in order to get Leaves of Grass in print. Professionals such as doctors and lawyers used to regularly “hang a shingle” after completing their apprenticeship in a barn or blacksmith’s shop somewhere, but that’s more a dream than reality for today’s pawn in the corporate (and legal and medical) systems. So far, my own businesses have been small media operations — where I’ve been the sole proprietor or an equal partner: a country-western FM station in the Macedonian capital of Skopje, an early independent news site called Tabloid.net, an infamous political-satire site I inherited from Gawker Media during the Great Recession, and now a regional print magazine called Desert Oracle, based in the small Mojave Desert town of Joshua Tree. But running a very small business is pretty much the same regardless of trade. This might sound comically simple, but your gross earnings are going to determine how much of the daily business tasks you do yourself. If you can pull in $100,000 a year, to pick a simple and realistic number, you don’t have the money for employees. As a sole proprietor, you won’t even consider yourself an employee. And you can’t afford much help from freelancers, contractors, temp agencies, TaskRabbit or hourly professional help from lawyers, accountants or tax preparers. Sales tax is a small part of my business, thanks to longstanding tax rules that benefit publishers of periodicals. I don’t charge or collect sales tax for subscriptions to the Desert Oracle, and the copies I distribute to bookstores and small shops in the U.S. Southwest are wholesale, meaning it’s up to the retailer to collect and report sales tax. But when people in California buy a back issue from the website or my office in Joshua Tree, I have to charge and report sales tax for the California Board of Equalization. It usually takes me about eight hours of absolute self-torture to compute the tax on the back issues sales to California residents, but my volume is so low that the state only requires one sales-tax return per year, and that is just enough time to completely forget the process by the time I have to do it again. You can go to a tax preparer, of course, and for a sole proprietorship it shouldn’t cost more than $250 to file your federal and state returns. But even a “certified” tax preparer won’t know much about your particular line of work, or what kind of deductions and expenses are reasonable or ridiculous. And most don’t care, really. Business returns are hardly ever audited, compared to personal returns. I’ve been using the small-business TurboTax software for most of two decades, and in the process I’ve actually learned how to prepare all these tax forms. I also buy the audit-protection plan every year, and even with that added $50 for peace of mind, tax-prep expenses are about $100 per year. As with your regular accounting, you have to collect and prepare all the data and paperwork before someone will take your money to run that data through their own system. It is a wondrous age to have your own little business, because you can get almost anything you need — inventory, equipment, packaging, forms, business cards — on the internet. But every type of business requires some arcane stuff that nobody else seems to know about. It took me months of searching and queries and confused correspondence before I found a web-press commercial printer who could make and bind the eccentric little books I designed for eccentric combinations of paper. Meanwhile I learned how to get an ISBN number from the Library of Congress, how to submit pre-press issues, what kind of bar codes magazines require, and the one tiny business that assigns them. If you’re selling a physical object that needs to be shipped, you get to learn about printable postage, Priority Mail, UPS, FedEx, etc. If you send a lot of business mail, whether marketing or invoices or a publication, the best way to limit future heartbreak is to find your local “Business Mail Unit” of the United States Postal Service and ask to meet with someone who can explain everything. Some big mailing units, such as Oakland in the San Francisco Bay Area, have regular introductory sessions to go over the arcane and impenetrable volumes of postal regulations and classes of service. Smaller BMUs might send you to a big unit in the nearest large metropolitan area, or they might teach you what to do because you are such a polite and earnest new business mailer. This investment of time can save you huge amounts of money. First-class presorted mail, which I now use for the Desert Oracle after trying several other classes of bulk mailing, costs me half as much as regular first-class mail and requires much less labor on the stamping and labeling side of things. At a certain level of mail volume, it is worth the expense to either buy a robot that can stuff and seal envelopes or contract that work out to a fulfillment house. I’m hours away from the nearest fulfillment house, so I’m now shopping eBay and obscure industrial-machine resellers for a desktop robot to automate part of my quarterly mailings, because stuffing 2,000 envelopes over a couple of grueling days is enough to make me want to cut off my hands — despite the love and appreciation I feel for each and every Oracle subscriber. Nothing wrong with a home office, especially considering that you can write off a portion of your home’s expenses from utility bills to mortgage payments or rent checks. But if you share your home with children, spouses or other animals, a separate place to do business (and this could also be your garage or a backyard studio) is a wonderful thing for both getting things done and staying sane. When you need to work all weekend or all night, you have space and quiet. When you need hundreds of crumpled receipts and invoices stacked up just so while you cram six months of accounting into a week, cats and children cannot scatter your paperwork. Finding a place you can afford is the biggest issue for most sole proprietors. 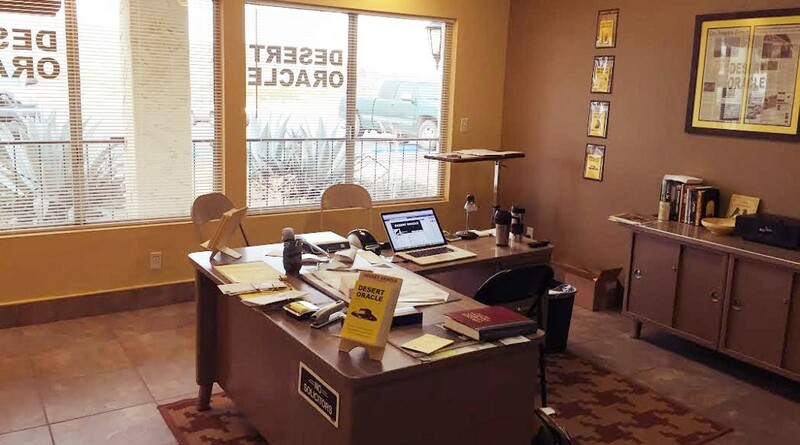 After six months of publishing from the dining room table at home and enough money in the bank to consider an inexpensive business lease, the challenge in Joshua Tree was finding a spot of any kind, because there was nothing available, anywhere, at any price. I asked everybody in town, posted a query to the community Facebook groups, checked all the listings online, and then walked through every door along our three-block-long strip of restaurants and real-estate offices asking about vacancies. There was a cursed suite in a five-office strip right there in downtown between the post office and the saloon, a place I remembered as an always-empty health-food store and previously as an art-supplies shop that had more recently failed as a hookah lounge and a place that rented “electric bikes.” The latter entrepreneurs had just announced they would be defaulting on their lease here, and a former Marine from the 29 Palms base already had dibs on half of this suite, for his outdoor-guide business. I took the other half — as well as the expense of building a wall and door to separate the space. The plans were simple enough to do myself in the Chief Architect program I learned to use to design a cabin I’m building, but then I had to get permission from the landlord and pay contractors to do the construction and painting. The local sign guy came out and I soon had our “shingle” — along with window signs and a plastic version on the highway sign. Plans for a handsome collection of mid-century office furniture were limited by budget, but then I found an entire mid-century office set in the shed behind my new office: desk with matching typing table and credenza, file cabinets, chairs, even a wheeled cart for some mysterious 1950s purpose that exactly fit a modern all-in-one printer. A few rolls of paper towels and 409 later, I wrestled the whole set through the doors, splurged $300 on a trio of wheeled wire shelves delivered right to my storage room by Amazon Prime, and I was done. It’s a good office. So good that other magazines sometimes send photographers to take pictures of my little magazine’s office. 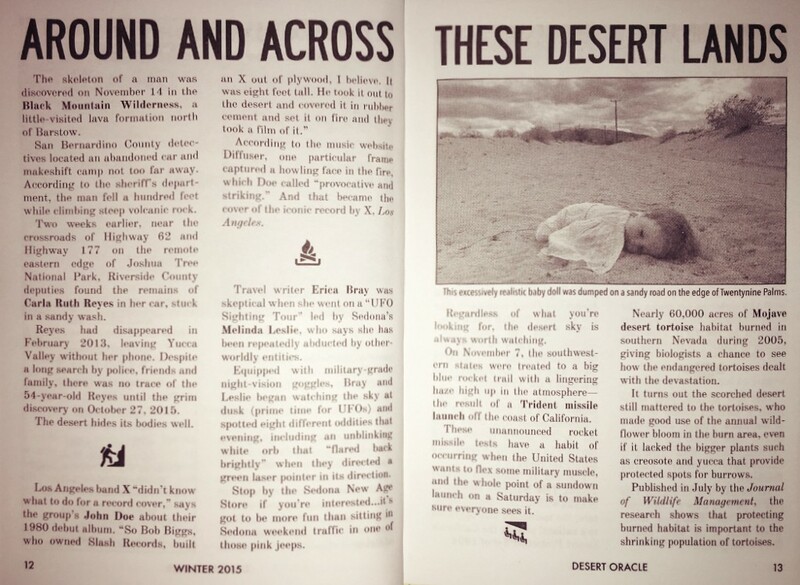 Readers visit from all over the world when they’re coming through Joshua Tree. Sometimes they buy me beers at the saloon. And when I tire of visitors, I just close the blinds and turn up the classical station or “Willie’s Roadhouse” on the satellite radio, pour a drink and type up another issue of the magazine. I work harder than I ever have for somebody else’s company, and I am still learning when it’s time to call it a day and go screw around hiking in the rocks for the afternoon, but nobody is ever going to microwave a slab of fish in my office.